Welcome to the SABERS travel basketball program. 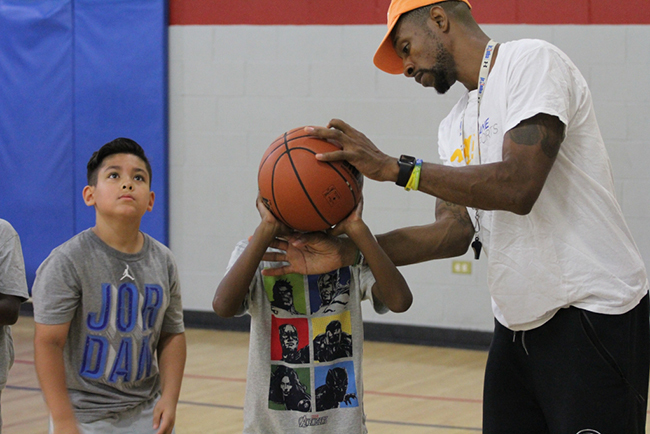 Sponsored by A-GAME SPORTS, the Sabers travel basketball program was started to help bring a new level of instruction to kids who are serious about playing basketball. While winning games on the court is an important element to our long term success, the primary focus for the coaches and staff is meaningful skills development for all of the kids on each team. Players will have the opportunity to train with professional coaches several times per week over the course of the season and see the results of their development on the court with weekly games or tournament play. Significance emphasis will be placed on physical conditioning, ball handling development and general on the court skills building. Overseeing the Sabers program will be Lavar Larrier, a long-time Westchester resident who played for New Rochelle High School, Mitchell Junior College in New London, CT and then Lehman College in The Bronx. Lavar has a significant number of years of experience coaching as well as instructing, having been an assistant coach at New Rochelle High School as well as assistant coach for the women’s basketball team at the College of New Rochelle. In addition to private and group basketball training for many kids in lower Westchester, Lavar also runs the basketball programs for the New Rochelle YMCA. Lavar has extremely strong ties in the local community, having established a reputation for being among the premiere basketball trainers in New Rochelle and surrounding areas. Starting the week of June 25th, Saber teams will play in the TDYCC summer league which includes 1 weekly game either during the week from 6 pm to 9 pm or on a Saturday from 11 am to 2 pm. In addition to this league play, each Saber team will participate in at least 1 weekend tournament in the tri-state area. Between eight to ten games in total are expected to be played during the season, not including unofficial scrimmages arranged between Saber teams and other organizations during the summer. The end of the season is expected to be the week of August 13th. Training for the season will begin the week of June 4th with no training during July 4th week. In total, there will be ten weeks of training, finishing the week of August 13th. Each week will consist of at least one, sixty minute team practice and skills training session, one, sixty minute conditioning session and one, sixty minute ball handling session. Practices and training sessions can take place indoors either at A-GAME SPORTS or other local indoor gyms as well as outdoor courts in the area. Each will carry a minimum of eight players and a maximum of twelve players. While all players on each Saber team are expected to get playing time each game, minutes should not be expected to be shared equally. Playing time for all players will be dictated by effort and progress made during weekly training sessions as well as on court success during actual games.